Shelley Harper. Portland Comic Con 2014. Her business partner, Ted, was manning their t-shirt booth while she waited in line for a photo op. Most of her Comic Con memorabilia was stored in an Ikea box at home, filled with receipts and ticket stubs and photo ops that never went into anything other than a manila folder. Scrapbooking wasn’t her thing – she respected it, but didn’t think she could do it. Post photo op, she walked past two tables: one selling leather-bound journals, one selling protective sleeve covers. They were the busiest booths that weekend. Idea struck. What about an easy-to-do scrapbook/journal? “Even at the table I was really quick sketching what I thought the subject header would be and what we needed the journal to do. Like your schedule, your autographs, funny things on stage they say at panels and all of the business cards you collect,” she said. Cue Creation Entertainment. The journals – a cardboard prototype, if you will – were sold at a Supernatural event. Success. With Shelley’s creative mind and Tracy’s epic designs, they created a journal to best represent fandoms. “We made these inspired things that would speak to people and started going to more conventions and started really doing better. Finally, last year at Minneapolis, we took the Road So Far journals [for the first time] …and we sold out,” Shelley said. 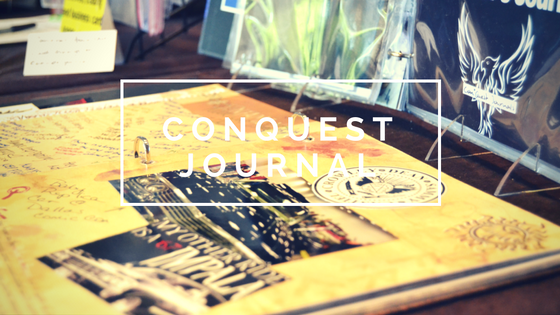 Essentially, ConQuest journals are the ultimate convention memorabilia holder. With its Supernatural, Doctor Who, Star Trek and Walking Dead-themed journals, your full Con experience can be placed in a piece-of-cake journal that eliminates the difficulty of scrapbooking. In addition to the three-ring binder filled with pre-made pages and protector sleeves, accessories such as themed stickers and bags complete the full look. Shelley Harper. Chicago Supernatural Convention 2016. Her puzzle pieces fit perfectly into that fandom’s experience.